This is the picture the other Blog site refused to let me post.. for about two weeks. Santa maria Bay. 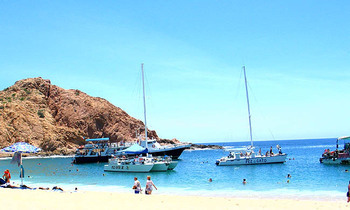 This was our favorite part of Cabo. This is the bay where everyone came to snorkel. Everyone, including boats fill with drunk snorkelers. Yes, drunk..or various stages of drunkeness. Quite a sight. We swam BEFORE they arrived.